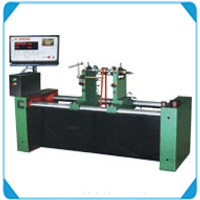 Machines model HDCM are belt driven horizontal type photo scanning Universal Hard Bearing Balancing Machine, provided with microprocessor based measuring panel HDCM – 8500 suitable for balancing different shapes of rotors, of Electronic machines, cylinders, fly wheel, rotor of centrifugal pumps and any other type of rotating machines. • Coast saving on manufacturing of precision adaptor to connect drive coupling to rotor. • Any rotor can be balanced without loosing time in manufacturing of adaptor. • Belt drive machine are more accurate (about 5 times) as compared to end drive machine. The machines features a very simple operation. The working cycle is fully automatic. From safety point of view a double press push button starts machine, Measures and stores the unbalance values on DPMs for two Plane simultaneously and stops machine. Key board facility provided in measuring panel for correct data deeding of rotor with l digit accuracy for its dimensions like A.B. C, R1 & R2. Tolerance limits of both correction planes i.e.t 11 & t12 can be feed so that when rotor is balanced within the limits respective LEDs glow up, indicating no further correction necessary. 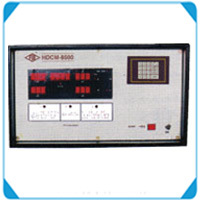 For other details please refer “ features of measuring panel HDCM-8500"
A matrix printer can be connected through ‘FIE’ software. It shows runs till rotor is balanced within balancing tolerance. ‘FIE’ software specially developed with 3-99 component indication is suitable for balancing of rotor with fixed locations for balancing correction. Drill attachment 8mm capacity portable drill With supporting overhead railing. Separate drilling attachment 19mm. Capacity with a vertical drilling head, manual. Portable type reverting hammer (piston type) speed 1800 blows/minute, capacity 6mm in a aluminum suspected from top with rail. Longitudinal movement of right hand pedestal by chain & sprocket attachment. 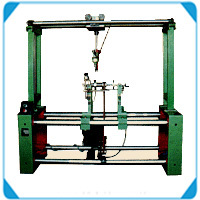 "FIE" Horizontal Hard Bearing Belt Drive Dynamic Balancing Machines. gmm / kg or micron.